Prof. Frank Mitloehner is clearing the air on the real amount of livestock emissions. In a 1,000 year old village in Germany (Juehnde), methane is not a dirty word. The recovered methane from a manure-fueled bioreactor feeds the burners that heat water for every household in the village. The same hot water provides heating. These households benefit from living adjacent to a livestock economy whose manure was once just a smelly nuisance. The manure is transported by truck to an enclosed bioreactor, thereby reducing odor and feeding a system that powers an entire community. Frank Mitloehner once called this village home. Now a professor and air quality UC Cooperative Extension specialist in the Department of Animal Science at UC Davis, Mitloehner thinks that if this village can do it, so can California. It is easy to see how Mitloehner was inspired to study ways that California can take advantage of its plentiful supplies of animal methane. 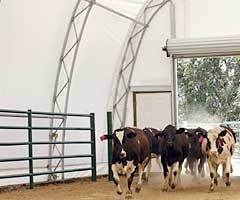 In eight bovine bio-bubbles that function as airtight barns, he captures and measures every emission from his resident livestock in order to understand how methane emissions vary with feed and herd management. At UC Davis, a commercialized version of a similar methane bio-reactor has been patented and licensed by Ruihong Zhang, professor in the Department of Biological and Agricultural Engineering. It has been constructed at the local landfill and will be used to demonstrate a sustainable village on the UC Davis campus. Mitloehner recently hosted a seminar for the Western Center for Agricultural Health and Safety at UC Davis. Since the Food and Agriculture Organization of the United Nations (FAO) committee released its 2006 report entitled, “Livestock’s Long Shadow,” he has challenged two key misleading sentences in the report. The phrase compared the contribution of livestock emissions to that of transportation. By saying the contributions to climate change were similar, the report led many environmental advocates to the conclusion that eating less meat was the equivalent of taking cars off the road, setting up a meat vs. miles tradeoff that exaggerated the methane contributions of livestock everywhere. Mitloehner’s response was the publication Clearing the Air, Livestock’s Contribution to Climate Change. After his paper was released, BBC, CNN and other media published his science-based estimate that the livestock contribution in the U.S. is 3.4 percent of U.S. emissions. Globally, 18 percent of warming was estimated to be livestock related. This estimate included livestock in the broadest sense - changes in land use, deforestation and desertification in developing countries. In spite of Mitloehner’s paper, the meat vs. miles perception has persisted among advocates, while press about transportation GHG has dwindled. Toyota took advantage in their advertising by showing how Prius emissions were more favorable than those of a sheep. Nonetheless, Mitloehner showed that U.S. methane emissions remain flat, while developing countries are increasing animal production to meet the demand for eggs, meat and dairy, especially in Asia. But why is the U.S. so low? The U.S. has fewer dairy cows. Today’s 9 million dairy cows supply 60 percent more milk than the 16 million cows in production in 1950. That means there is increased efficiency per cow for the same methane produced. Thirty percent of the methane in dairy production is from manure in ponds. There is the potential for recovery on the approximately 1,500 California farms, where the average herd size is 1,100 head. Methane has 20 times the warming potential of carbon dioxide, but when burned to heat water or to generate power, its warming potential is reduced by a factor of 20. The more fiber in the feed, the more methane is released by the rumen of the animal. One dairy cow in the U.S. produces an average of 20,000 lbs of milk per cow annually, the same amount of milk as five cows in Mexico, or up to 100 cows in India for the same, or less methane per cow. Reasons: low fiber diet, less parasites and less disease result in large differences in production per cow. Mitloehner occupies that middle space between the economically driven farmers who survived years of falling milk prices and the sustainable advocates that want dairy to either disappear entirely or retreat into historical practices. When he is not serving on the President’s Council of Advisors on Science and Technology (PCAST) or the National Academies Institute of Medicine, he keeps company with local farmers and students and he answers to science. Dairy addicts like myself, whose ancestors have evolved on milk for over 10,000 years, are likely to continue to frequent the organic dairy cases, hopeful that there are mutual benefits to paying higher prices for local labels in returnable glass bottles as a way to sustain the farms. In reality, California has been exporting surplus dairy products to growing populations since the 1890s and that won’t change soon. Those markets do more to keep dairies profitable than my weekly milk and yogurt purchase. Lactose for pharmaceuticals and whey proteins for infant formulas are shipped internationally from several of California’s mammoth cheese factories, sometimes worth more the cheese itself. Mitloehner believes that “sustainable intensification” is the solution to keeping local dairies viable. He believes that science will provide the path to better regulation. The dairy nations that seem determined to get at the truth - New Zealand, France, Ireland and the Netherlands - have formed an international partnership at FAO entitled LEAP to address the issues. Mitloehner's leadership as chair of the partnership will keep methane bioreactors on the agenda. Mitloehner tells the story of how he neutralized errors in the FAO report “Livestock’s Long Shadow” (YouTube). LEAP site at the FAO. NGOs include World Wildlife Federation and Greenpeace. Mitloehner said that Greenpeace is also a partner although not listed on the site. Workshop materials available for download. July 2012 opinion post by Robert Goodland at New York Times food blog. This is an example of criticism of Mitloehner’s role as head of the FAO partnership LEAP (Livestock Environmental Assessment and Performance).